Over the past few years, I noticed a change in my hair. 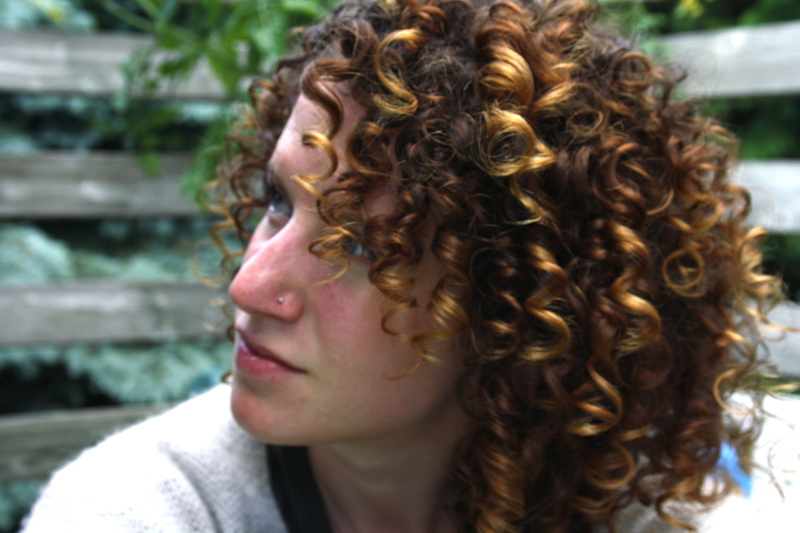 Curls that were once bouncy, almost afro-like in quality, were becoming more stretched and dry. No matter what I put on my hair, the slow ‘straightening’ process was continuing. I agonized over this — hair that had once been the bane of my existence had become something I was incredibly proud of, and I was slowly losing it! I assumed that hair changes as people get older, and that this was perhaps my hair transformation, brought on by fluctuating hormone levels, or whatever it is that changes hair. Then, I bought a book that told me about how to properly care for curly hair. Using methods that I never would have thought of before, I switched my routine drastically. Lo and behold, my hair thanked me, with newfound curliness! I was delighted. I’m not saying that this works for everyone, but it definitely worked for me, so it’s something I’d like to share with all of you. Today, I’ll just go over the basics – what the rules of the Curly Girl Method are, and what kind of products to look for. Later, I will cover how to actually wash (or co-wash, short for conditioner wash), style, and maintain your awesome curly ‘do! First Step: STOP using shampoos with sulphates in them. What are sulphates? They are cleansing materials that strip the hair of natural oils. Guess where sulphates are also found? In dish soap! Most shampoos have this, although many companies are realizing the need for no sulphate shampoos. If you see ingredients that have ‘sulphate’ included in them, it is NOT a curly girl friendly shampoo! Curls after having taken care of them. Fresh! hair for a few days, so you don’t want anything with alcohol, as it will dry out your hair. Now get out there, start looking at product labels, and consider a curly girl journey! Next week I will be covering a more in-depth look at how to co-wash. Thanks for reading! I so needed this! I thought after my kids were born i had just lost the life of my hair and had to deal. First of all Phoebe, thank you so much for your kind words! Next, how long has this hair transformation taken place? I realize that people’s hair CAN change, however, I would definitely recommend CG to bring your natural curl back. Why not use a shampoo that’s sulfate free – I like Nature’s Gate Tea Tree Shampoo – so you’re still getting rid of buildup, which can weigh your hair down. Secondly, stick with a lighter conditioner – I personally think TreSEMME moisturizing naturals conditioner does a GREAT job without weighing down, but another option may be Yes to Carrots Nourishing Conditioner (I have a fine-haired friend who adores this). Both are inexpensive and relatively easy to find at the drugstore. My last bit of advice would be to rinse out about half of the conditioner, but leave some of it in, and apply a sulfate and silicone-free gel (I use Giovanni l.a. natural styling gel – about a quarters worth). Scrunching the hair from the ends to the root while your head is upside down is key! And if you’re looking for volume, use a diffuser with a cool setting on your blow dryer, tilt your head upside down, and scrunch from the ends to the roots again. My transition took about 1 week to really start to kick in; please let me know if you need any further information or advice, and how your hair journey unfolds! Best of luck! !